Why would an artist create a piece of work that will be washed away within days? For the sheer joy of creating it,” says Deborah Lindner of the Utah Foster Care Foundation. The Foundation presents its 3rd Annual Chalk Art Festival June 17-18 at The Gateway, and is actively looking for local artists to participate. The Utah Foster Care Foundation hosts this event to increase awareness of the need for foster/adoptive families in Utah and raise money for the Foundation’s Wishing Well Fund. 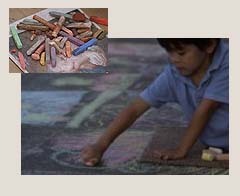 The creation of a chalk painting takes many hours and is often not as simple as it seems. First, the artist must draw an outline of the original painting in proper proportion using pencil or a charcoal pastel. Then they begin to lay the base of colors. Using a number of colored pastels, the artist layers the chalk, blending the colors to create shadow, contrast, and depth. So one might ask, ‘why street paint when the artists’ efforts disappear immediately?’ As avid street painters will tell you, this is performance art, where the process of creating the work is more important than the finished piece. For many, the dialogue with spectators can be as rewarding as creating their masterpieces. People can view the work in all stages of progress, from layout and design, to applying colors, to the finished creation. Master Artist Lee Jones of Orlando, Florida will hold a free workshop for all interested artists on Saturday, June 11 at 9:00am at The Gateway. You may get more information about the Chalk Art Festival and download registration forms at www.utahfostercare.org or by calling 994-5205. Chalk, water and lunch are provided. The deadline for adult artist registration is Wednesday, June 8. Festival hours are Friday, June 17 from 4:00- 9:00pm and Saturday from Noon-8:00pm.